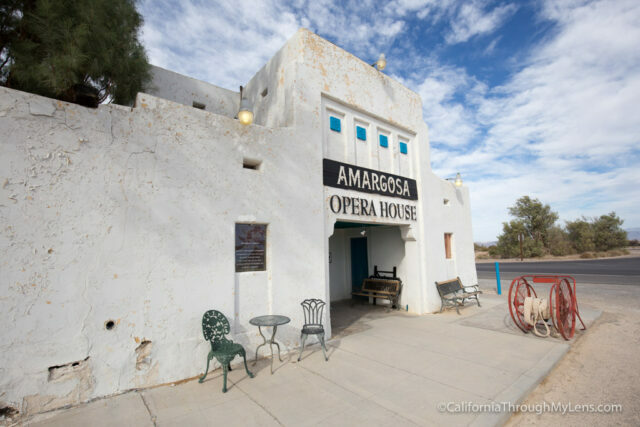 Death Valley National Park has a ton of amazing natural wonders in its vast expanse, but for man made attractions it is hard to beat the crazy, fun Amargosa Opera House. 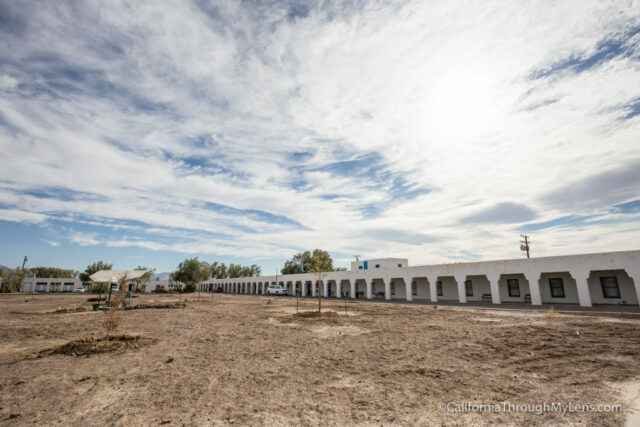 Located on the east outskirts of the park, this hotel and fully functional opera house is a must stop on any visit to the park from the east side. Here is all the information. 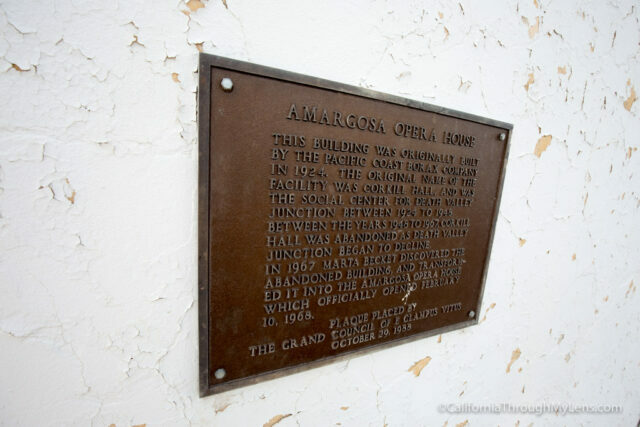 Amargosa Opera House is located in Death Valley Junction at the intersection of State Line Road and Highway 127. 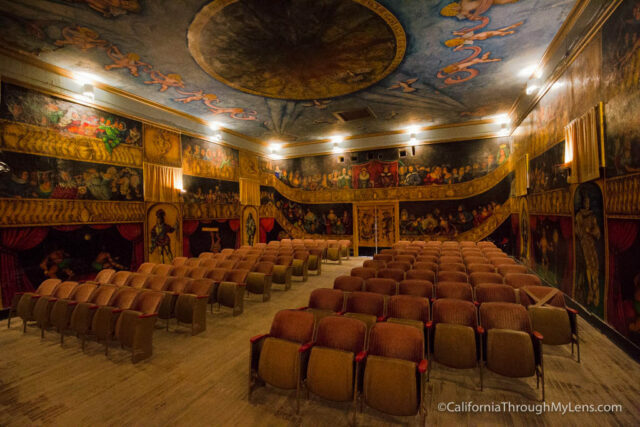 It is hard to miss as it is one of the only things in the entire area and it takes up a couple blocks. There is parking in the dirt outside of the hotel and the opera house. 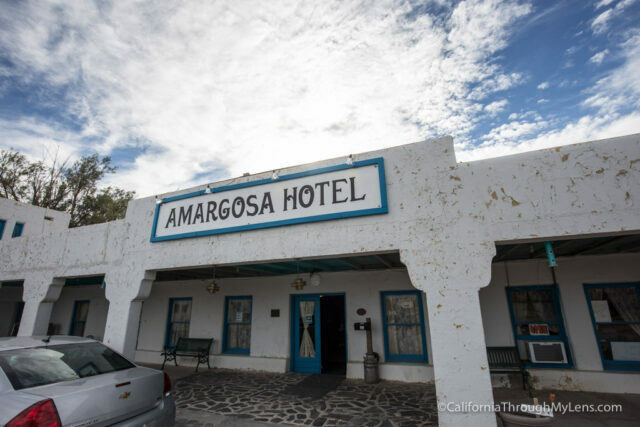 The first thing I did was head into the hotel which is a historic building in California. You can read all about the history here. The hotel is pretty unique inside with a large fireplace and chairs in the lobby and a gift shop in the back. 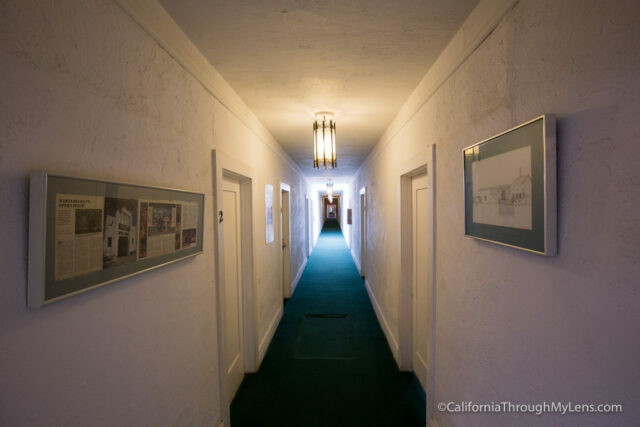 The hotel is supposed to be haunted and you can get that vibe just by walking down the massive and dimly lit hallway they have to the rooms. 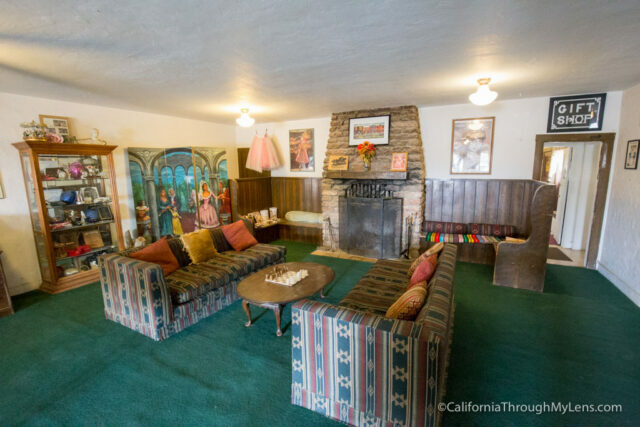 I didn’t get a chance to see any of the rooms as I was not staying there but I heard it is a really popular spot due to price and how close it is to the park. I spoke with the woman working the front desk and since it was not busy at the moment she was able to lock up and take us over to see the opera house (for a fee of $5 each). I have to admit that from the outside I was not expecting much. The hotel facade is just a dim white with blue pops of color so I expected the opera house interior to be more of the same. Upon walking inside though I was blown away. 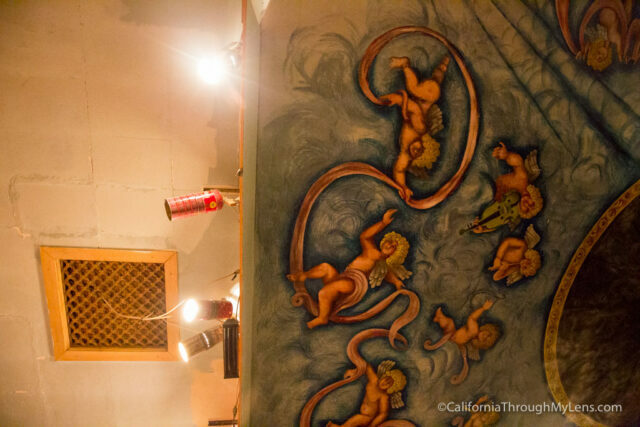 The entire walls and ceiling are hand painted and beautiful. 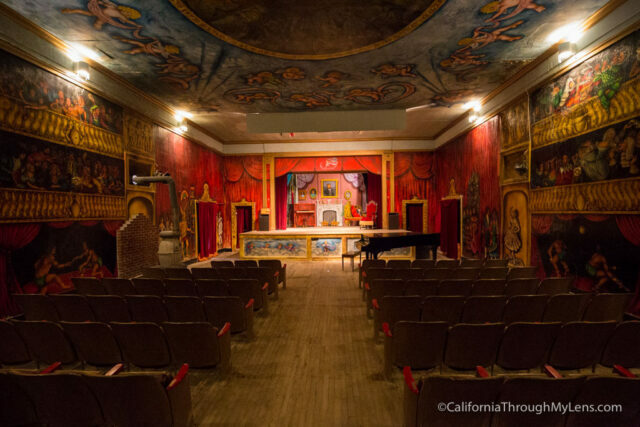 The opera house looks like something you would expect to see in an old town in Europe, not in the middle of the California desert. On the 15 minute tour we walked around and took pictures as the woman working there told us about the history, the paintings and the shows they still have in the room to this day. I admit that I was not paying much attention as I was walking all over trying to get good shots in the short time we were in there, but what I heard and what I read after the fact was certainly unique.When our 15 minutes were up, we walked out and the magical opera house was locked behind us. As far as haunted goes, the women who took us on the tour said that she has heard and seen ghosts on two separate occasions. Take that with a grain of salt, but all of you ghost hunters out there should check it out and report back in the comments. Here is a video I made which shows the opera house as well. My friend and I were both really impressed with this unique spot, as were the people I have shown it to after the fact. If you happen to be driving this way into Death Valley, you really should consider checking it out. 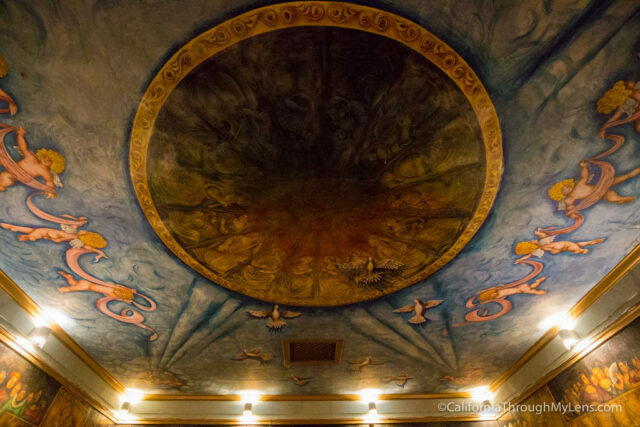 Be sure to pay the $5 to see the opera house interior though as that is where the magic is. Let me know if you have been and what you thought in the comments.